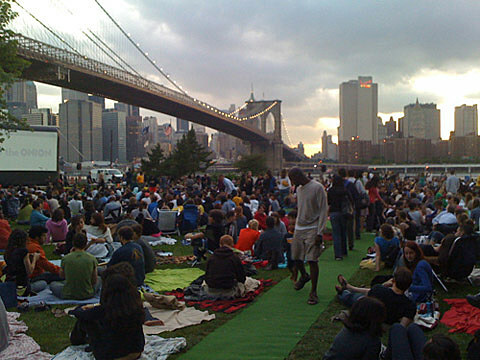 The “Movies with a View” series returns in 2011 at Pier 1 near the Brooklyn Bridge for two+ months of film under the stars and in front of the skyline. Kicking off in early July, the NYC-themed series will offer showings as varied as Basquiat and An American Tail, in addition to crowdpleasing favorites like Ghostbusters and Breakfast at Tiffany’s. Full film schedule is below, and make sure and vote “for your favorite New York story”, to be shown at the final screening, on September 1st…. Thursday, September 1 – Public Vote – Choose your own favorite New York story! Film list for the public vote will be announced on August 25. Visit brooklynbridgepark.org to cast your vote.